What a fun dog story! Perfect for learning about letter writing or community helpers! This picture book shares the tale of Arfy, a homeless mutt who lives in a box in an alley. Arfy writes to every person on Butternut Street about what a great pet he'd make. His letters to prospective owners share that he's house broken! He has his own squeaky bone! He can learn to live with cats! But, no one wants him. Won't anyone open their heart--and home--to a lonesome dog? Readers will be happily surprised to learn just who steps up to adopt Arfy. Can I Be Your Dog? was written and illustrated by Troy Cummings. It was published by Random House in 2018. I am potty trained, and I have my own squeaky bone. If you’re interested in writing a story through letters, this is a great mentor text. There’s lots of humor in this story. I especially liked the different styles of responses to the dog. The letters show the different personalities and hints of backstory in a just a few words. It made me want to try the challenge of writing a story told through letters or notes! 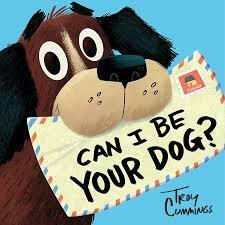 This is a fun book to show students examples of letter writing and persuasive writing. It also shows different community helpers or places in the community. It may even lead into discussions about homelessness. The big, colourful illustrations make this book great for reading aloud. Pretend you are an animal. Write your own letter to ask for a home. Draw a map showing different places the dog wanted to live. Tell the story using your map. What do you think happens after the dog gets to his new home? Draw a picture to show your idea.